North American Aviation’s “T-6, SNJ, Harvard” Texan was one of the most important aircrafts developed during the 1930’s. As an advanced trainer for the military, AT-6 for the Army, SNJ for the Navy and Harvard for Canada, it featured retractable landing gear, increased power (600 HP), and more sophisticated controls, as well as two .30 caliber machine guns, gun camera and bomb rack fittings. Through its career the AT-6 served as a trainer for instrument flight, aerobatics, bombing and gunnery, and, equipped with a tail hook, as an aircraft for carrier qualifications. Several nations employed the Texan as a fighter and bomber, a Mexican T-6 is even credited with the sinking of a German U-boat during WWII. Use of the Texan by the Israeli, French, and South African Air Force as a ground attack and forward air control aircraft continued into the 1960’s. More than fifty years after its introduction, fourteen countries still used the Texan in some capacity, with its use in combat documented as recently as 1980. These aircrafts were surplused in great numbers after the war for prices as low as a few hundred dollars. 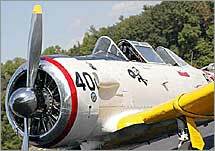 To buy one today that has been restored like Kevin Russo’s SNJ-6 can cost close to a quarter of a million dollars. The Texan has proven to be one of the more durable and popular warbirds in the air. Of the 15,000+ Texans made, only about 400 are still airworthy today.